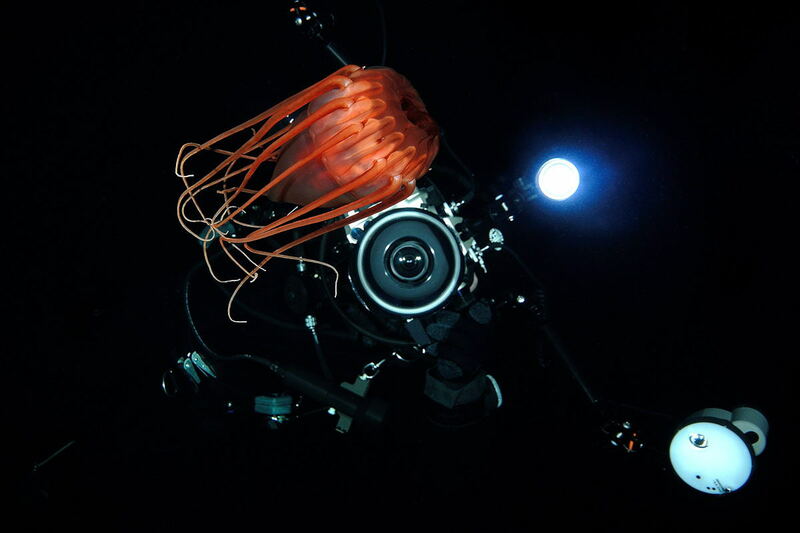 The Periphylla jellyfish live several hundred or even thousands of meters deep in the open ocean and is only seen by divers on very rare occasions. To join the Periphylla Safari is one thing, in the middle of the winter it is special. To go dive during the middle of the night in the middle of a fjord is why the Periphylla Safari is so special. But since this is the period when they come to the surface, we need to go during the night to get this unique encounter. Lectures are included on the Periphylla Safari. The Periphylla Safari gives you a great opportunity to experience this awesome deepsea creature close, and our wreck diving is also spectacular this time of the year. If you want a longer stay it is possible to book extra days before and after the Periphylla Safari. Diving with the Periphylla takes place in 300 meters deep water, in the middle of the night and in the middle of the winter far from land. Good buoyancy control and diving skills is a must for obvious reasons. If you find this interesting, join us for a truly one of a kind dive experience. To make the dives safe and enjoyable we use a setup with a buoy with a weighted line with lights attached. All participants must do a training dive on the first night of the safari to see how it work in a safe location. The bell of the Periphylla may reach 15-20 cm in height and the 12 tentacles grow to almost half a meter each. The Periphylla is bioluminescent and it can produce its own light. At the same time, it is allergic to sunlight and prefers the deep water. Are you a photographer or like to shoot, you have unique opportunities. We have an average viz water at around 25-35m in January and February. Detiled explanations before dives will give you the correct information needed to choose the right lens etc. You can dive this package on fixed dates every year, with slight variations of dates Water temperature is around 7-8 celsius. The Periphylla Safari takes place in the winthere months, Fill in the form below and we will put you on the "interested list" and get back to you when we plan our next event. We offer a fixed lengths of stay by default, but we are flexible if you want to make changes. Use our feedback form if you are unsure or have any other questions. When booking please be advised that you accept the terms and conditions set on our Booking and payment page.